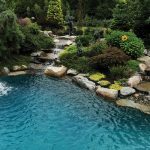 Not content to build average pools, Pools and Spas by Richard has been creating poolscapes in Rhode Island, Massachusetts, and Connecticut that are above the industry’s standard for design and construction for the past 45 years. To achieve this goal, owner Ted Richard collaborates with outside experts, including landscape architects, and has gathered a team of skilled artisans whose sole purpose is to develop the best possible poolscapes for discerning clients. Many in the industry would say this objective has been met: they have honored a number of the builder’s innovative poolscapes with awards and accolades. And the service does not stop when the pool is built. Pools and Spas by Richard has a fully staffed department that opens, maintains, and closes pools. Additionally, when equipment needs replacing or if a pool needs a touch-up, the company’s expert craftsmen are on hand to provide dependable assistance. Pools and Spas by Richard also believes in keeping on top of technical and style advancements in the industry by being a full member of the Association of Pool & Spa Professionals and Carecraft, a nationally respected group of pool designers and builders. “By aligning ourselves with Carecraft, we provide our clients with the highest quality products and equipment,” states Richard.